History: From an early age, Nathan Darling showed a keen interest in cooking with his mother which inevitably led to pursuing a culinary career. 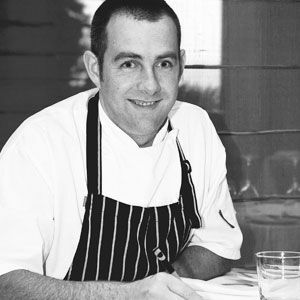 Now, having worked in a number of restaurants, Nathan has all the experience and training of a great chef. He sits down with us and chats about his kitchen. How would you describe your food in three words? What do you eat when you are at home? I have three kids so I try to cook very healthy meals. Kids are often picky eaters so I try to be colourful and simple. I never eat the frozen processed stuff and everything is made from scratch. My youngest is five and I try to teach her. She already knows all the vegetables. We all know how Gordon Ramsey rules his kitchen. Are you quite a kitchen tyrant or do take a more gentle approach? MacDonald’s. Not too often though, once in a while. Well, I’m a bit of a Bono fan so he is definitely on the top of the list. Also, Grant Achatz is not far behind. He’s a well known American chef who is considered to be on the cutting edge of molecular gastronomy. I like to go home and just relax with the kids. Occasionally I stop at the pub but most times I like to just sip on a red wine at home to wind down. Being a chef you have to work long hours, how many cups of coffee do you drink a day? Funnily I don’t drink coffee. But for what I’m missing out on in coffee, red bull makes up for! Beautiful steak with foie gras and truffle. Darling’s Setting- Sails on Lavander: This modern design restaurant located right on the water's edge of McMahon Point, offers breathtaking iconic views of the Sydney Harbour, Opera House and the Bridge… It creates a perfect backdrop to impress guests/clients. With unbelievable views and Nathan Darling’s inspiring menu (and tempting wine list), your dining occasion is off to a good start and is sure to end spectacularly, especially if you top it off with a Darling dessert. Contemporary Australian: Nathan’s contemporary Australian menu is focused on seafood, red meat and fresh produce which he specifically sources through established contacts and suppliers. His overall aim is to provide diners with the highest quality produce and freshest seasonal ingredients to enhance their dining experience. Tasting Menu: Sails Tasting Menu comprises seven courses with matching wines which is ideal for corporate luncheons as this menu reflects Nathan’s best choice dishes, along with the Sommeliers best choice matching wine… It eliminates the time in ordering, allowing diners more quality time to discuss business.